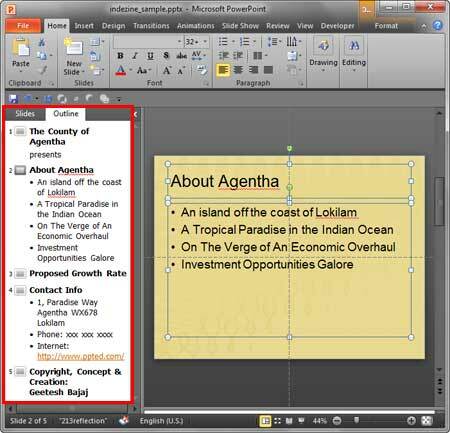 Learn how to set proofing language for an entire presentation in PowerPoint 2010. If there are more than one text container on the slide and nothing else, press Ctrl+A to select all the text containers. If there are more than one text container on the slide that also includes other slide objects, press Ctrl+A to select all the slide objects on the slide, and then deselect the slide object which you don't want to be the part of the selection. You can quickly deselect any object by Shift-clicking the object. At this point of time, you have selected the text containers you want to alter the proofing language for, as shown in Figure 1. Now click the Language option on the Status Bar (highlighted in red in Figure 1). 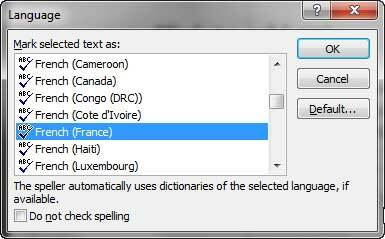 This brings up the Language dialog box that you see in Figure 2. Scroll down to select an installed Editing Languages -- installed languages can be recognized by the check mark preceding them as shown in Figure 2. Choose the language you want to use for your selected text container. Thereafter click the OK button. This will change the proofing language option on the Status Bar. 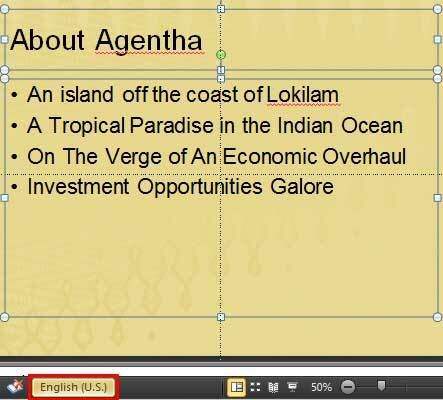 You can repeat this process to change the Language option for all the other slides in your presentation. With your presentation open, access the Slides/Outline pane and select the outline tab, as highlighted in red in Figure 3. 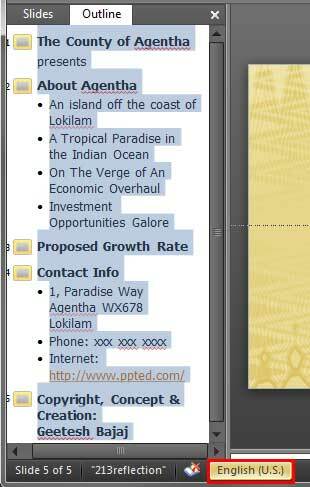 Within the Outline pane, select the entire text by pressing Ctrl+A on your keyboard. Now, click the Language option on the Status Bar (highlighted in red in Figure 4). This summons the same Language dialog box that you saw in Figure 2 above. Make changes to the proofing language, as required -- this changes the proofing language for your entire presentation. Note that this approach only changes the proofing language for text placeholders -- and leaves text boxes and shapes untouched. For more information on the differences between these various text containers, look at our Text Placeholders vs. Text Boxes tutorial -- Shapes with text behave just like Text Boxes. Tip: Want to change the proofing language easily all across the presentation in the Masters, tables, SmartArt, Notes pages, grouped shapes and text boxes, text placeholders, etc.? You may want to explore an add-in called Lingo that does this for you – learn more in our Lingo 2 review.